Game-2 TAINAN CITY, Taiwan - Jackson McClelland got the win and Matt Maurer finished off the last four innings as the Pepperdine baseball team stayed perfect at the Formosa Cup with a 5-3 victory over Jobu University of Japan. Bryan Langlois (Oak Park, Calif./Oak Park HS) continued his hot hitting with two more RBI and Manny Jefferson (Lakewood, Calif./Lakewood HS) got things going with a two-run double for the Waves, who have one game left at the international exhibition. Jefferson and Langlois both struck in the second inning as Pepperdine scored four runs on three hits, manufacturing all the offense it would need in the frame. Jefferson smacked a ball deep off the fence in left-center, plating a pair and then Langlois drove a single to right with the bases loaded. Langlois now has six RBI at the competition. McClelland (Beaumont, Calif./Redlands East Valley HS) gave up just one run through five innings of work, leaving with a 4-1 lead prior to the sixth inning. The Wave outfield played a big role in preserving that lead as Jack Ross (Gilroy, Calif./Palma HS) made a pair of diving grabs to end the third and fourth innings, and Aaron Brown (Chatsworth, Calif./Chatsworth HS) threw a runner out at home from centerfield in the first. Ross' second diving catch came in foul territory and he was able to get up and throw the Jobu runner out at first for the inning-ending double play. Brown fielded a line drive deep in the outfield and threw a strike to home, nailing the runner from second on one hop. Maurer (Medford, Ore./North Medford HS) held Jobu scoreless until there were two outs in the bottom of the ninth, but it was too little too late as the Waves got the win. 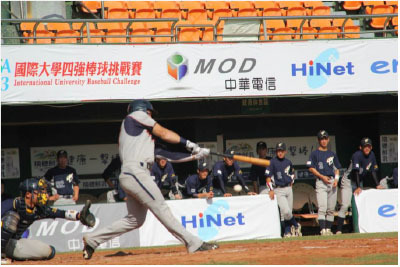 The Formosa Cup is a four-team event with squads from Taiwan, Japan, United States and South Korea playing three games apiece. All the games will be broadcast live on YouTube.